You've found the “U.S. Mangalitsa Pig Breeders” page here at Hobby Farm Wisdom! If this is the first time you have visited our site: Welcome! The Mangalista is a Hungarian breed of domestic pig that has been referred to as the “Kobe beef or pork.” They were developed during the 19th century by crossing Hungarian breeds from Szalonta and Bakony with the Serbian Šumadija breed. There are currently three Mangalista breeds: blond, red and swallow-bellied. The only difference between these breeds are the color, all other characteristics are uniform. 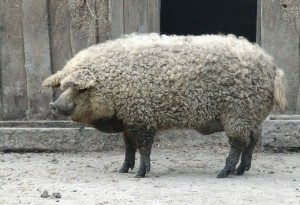 Mangalista pigs are unique in that they have a long and thick wooly coat similar to a sheep. While not favored by the larger commercial productions, the Mangalista is popular amongst farmers and consumers for its fatty, marbled meat that has superior flavor. It is primarily used for sausage and smoked ham.